When I began reading How I Learned To Sing, I decided that I’d mark all the pages I really enjoyed. It wasn’t long before I ran out of post-its. Mark Robinson has put together something rather wonderful in his collection of new and selected poems. It’s a substantial body of work that is hugely engaging and engendered a wide variety of emotions in this reader. 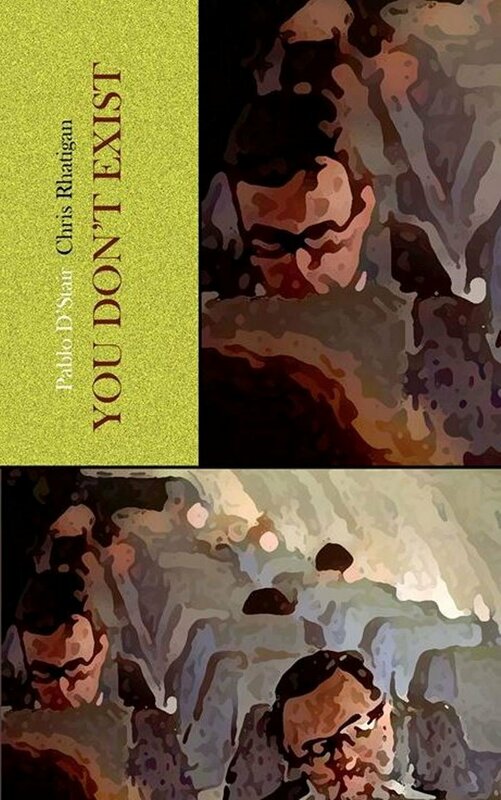 It’s divided into several sections: The Dunno Eligies, How I Learned To Sing, Esperanto Anyone, from a Balkan Exchange, from Half A Mind, from Gaps Between Hills and from The Horse Burning Park. In this sense, it’s the best of the poet’s work and spans many years of penning. The sections carry different flavours, but they do share common ground. The theme I most enjoyed is one I’d call ‘loved and lost’. I don’t mean this in relation to meeting people and moving on, but in terms of the sense that all great moments, big or small, have passed. No matter how delicious the pie, it doesn’t last forever. This is such a great theme here because Robinson’s scope for love is enormous. We get to zoom in on details of everyday life and then back out again to gain perspective. We can find amazing ways of looking at the world through cooking and kitchen disasters. There are journeys through the generations that are intimate and personal on the one hand and universal at another level. There’s even a love of bitterness and frustration, for to feel these things one needs to be alive and that should be celebrated at some level. There’s occasional resignation but, like all else, this is transient and Robinson is able to regroup and find a way to cope or to move forwards with something resembling hope. My favourite sections are the How I Learned To Sing of the title and those from Half A Mind. I found these sections incredibly moving. Many of them capture moments of family life, written as grandchild, child, partner and round the cycle of parenthood. The work achieves a huge amount in so few words that it made me wonder why I don’t read more poems and has me resolving to make sure I find space for poetry in my world whatever that requires. A lot of the poems are concentrated and intense, so it was also a treat to be presented with bursts of humour that allowed for the cleansing the palate from time to time. What I do realise is that I won’t be able to put together the words to do this work justice. I thoroughly enjoyed it and felt hugely moved on many occasions. I’m sure that all who come to read it will take their own versions and interpretations away with them. For me, I felt reassured about my own life somehow, as if the journey through the ups and downs helped me to work something through my system that needed shifting. Totally engaging, hugely enjoyable and ultimately rather uplifting. So here’s to you, Mr Robinson. Bravo. You Don’t Exist (US) brings together two novellas by a couple of very talented individuals. They have common themes and share something in terms of style, which means this is a strong marriage and a successful one. Both stories concern the finding of money. In the first, Bleed The Ghost Empty, the protagonist stumbles into a load of cash that just happens to be in the car of a murdered individual. In the second, Pessimist, a much larger, life-changing, amount of cash is picked up by Pullman at the baggage collection of the airport (‘more like a bus stop’) in Moline. You’d think that the finders would be celebrating, all this free money at their fingertips, only that wouldn’t make a very interesting story. Instead, both men feel the weight of paranoia upon them. They begin to question everything. Need to work out all the angles so they can keep themselves safe. They become so entrenched in their need to study all of their actions that even the simple decisions carry a new meaning. D’Stair’s character is escaping from a broken life. His mind is already pumped full of adrenaline and insecurity as he passes through places that barely seem to exist. When he has to stop to fill his car with fuel, he makes his discovery and begins to unravel as his thoughts go into overdrive. In a very good way, this is typical of the author’s work. He worms his way into the present and finds an anxiety and pointlessness that borders on horror even in the smallest detail. Pullman, is a different creature. He is drawn to study his whole life and the prison of work and earning has created for him. The worst part of it all is that he’s become totally institutionalised in the consumer way of being and the prospect of liberation from it seems like a nightmare. This one’s more directly challenging to the reader, I think. It points the finger and asks about values and experiences and purpose all the way through – Pullman is a kind of cracked mirror that you are forced to look into and the reflection isn’t going to let you off the hook easily. I really enjoyed these stories because they, perversely, made me feel incredibly uneasy and uncomfortable from the start. They plough through the present like razors through flesh and that unflinching attention to the moment is often very disturbing. This is seriously good writing in a form that’s not likely to burst into the mainstream any time soon. Even so, I hope that this review will help it get into a few more hands so that it begins to gather some of the momentum it deserves. Whilst recommending this read, might I also suggest that you don’t tackle it when you’re feeling very alone and that you keep your own personal crutches (smokes, beers, whisky et al) very close to hand. Another belter from All Due Respect books. If that weren’t enough, Angels Of The North (US)is written with a terrific style and voice. Best of all for this reader is the quality of the simile and of the amazing descriptive powers on show, for this is another area where I reckon Ray Banks truly excels. Plenty going on in the world just now. 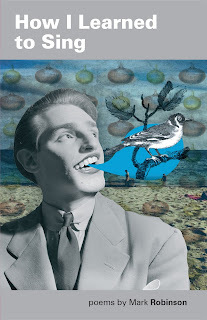 I’ve just come from a really nice read of an interview between Patti Abbott and Rob Hart. It’s a story that shows up some of the stresses and trials a writer may have to go through and is an example of how the effort is worth it when the quality is there. You can find it here if you’re interested. I’m also enjoying a rare warm day here on the coast. I feels like summer and I’m going to take full advantage of it. I even wrote outside today. That doesn’t happen often. Whether it’s the weather or has more to do with me reaching a tipping point in my current novel, I’m not sure, but I’m hoping to make hay. 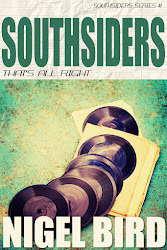 This one’s the fourth in the Southsiders (US)series. 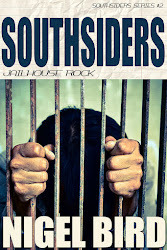 If you haven’t checked out book one, take the link and have a look. Books two and three are somewhere in the Blasted Heath ether just now, but I have a feeling it won’t be long before we crack on. 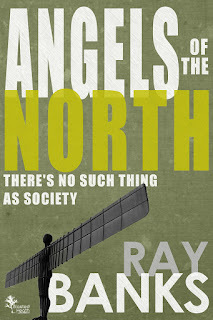 Talking of Blasted Heath, I’m currently reading Ray Banks’s Angels Of The North (US). If I had a load of boxes that I liked to tick for a novel, this one would definitely have most of them covered. It’s tremendous stuff. How’s this for a turn of phrase? In context of the sloth of a lady being discussed, this is absolutely perfect. I can wholeheartedly recommend the book even though I’m just a third of the way through (there’s no way this one is going to let me down). Also in the land of the Heathens, it’s not long until the premiere of the movie of Douglas Lindsay’s books on Barney Thomson. The film’s called The Legend Of Barney Thomson and if you want to get up on what is likely to be a very hip and cult piece, you might do well to read the books first. The omnibus (US) is a bargain. I can also offer you this freebie if you don’t have it yet. Beat On The Brat (US) is available to download for nothing for what’s left of today and tomorrow. And to my thoughts on last week’s read. 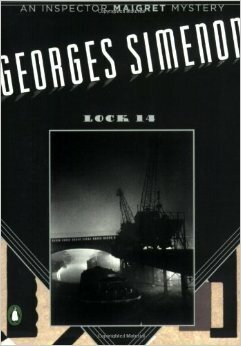 I’ve read George Simenon’s Lock 14 (US)before. 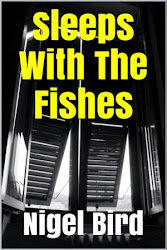 It was many years ago and at the time I was living on a boat on the Regent’s canal in London, which most likely made the book all the more of a treat. This time around, it carried waves of nostalgia, set as it is on the canal boats of France. A murder has happened at Lock 14. The body of a woman is discovered in the straw in a stable. She’s clearly not a local, but is unknown by all. When she is identified as the wife of the owner of a pleasure boat, the almost aristocratic Sir Lampson, Maigret is surprised by the cold reactions of all those who knew the victim. There’s plenty of stiff-upper-lip and more besides. The search for the killer proves to be perplexing and the clues that are found seem to appear a little too easily for Maigret’s liking. It’s all compounded further when one of Sir Lampson’s companions is also found dead. Lampson becomes the chief suspect, but he carries himself well and does his best to cope with things by remaining in a haze of alcohol. Other boats and crews come in to play. There’s a touching relationship between a boat-owner and her mute crew, a beast of a man in the Jean Valjean mode. We have the entertaining Madame Negretti, soon to be thrown out like a piece of used trash, the stoic Russian Vladimir and the community who inhabit the Lock-keeper’s bar. All of them are to come under suspicion and it’s not a simple thing for Maigret to unpick. As the story unfolds, there are some nice studies of canal life. We get to see inside the homes of a community of people in decline. There’s conflict between the diesel boats and the horse-drawn craft and they’re always in competition to get the best runs in order that they can do as much business as possible. There’s also, as is often the case, the pleasure of Maigret’s musings on the layers of society and his ability to feel respect for folk from any of those tiers as long as they’re worthy of it. 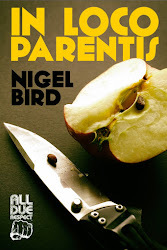 The first two thirds of this one were pleasurable rather than gripping, but it’s all worth the effort to get through for the last section where it all comes together to reach a powerful and emotional climax. A good read then, if perhaps not a great one. The kind of book you might enjoy while idling away time on holiday or while taking a leisurely journey down the canal some time. It certainly had me looking forward to my summer break in France this year and I'll definitely be taking along another Maigret as a companion when I go.